This guide shows you how to directly import timesheets from Deputy into MyPaye UK. 1. 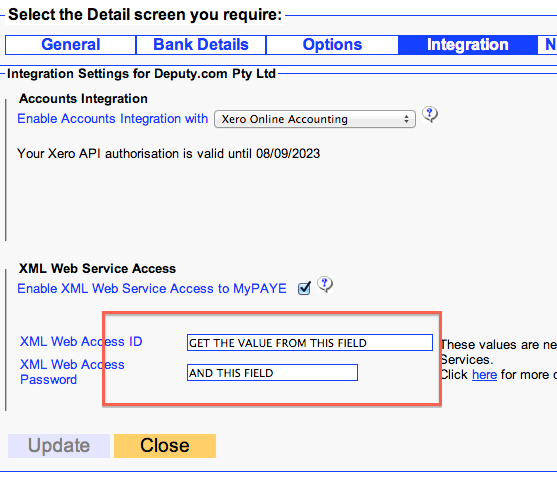 You need to get the XML Web Service ID and Password from MyPaye. Login to Mypaye, go to Employer Details, Integrations page to find these details. 2. Employee Reference in MyPaye must match the Timesheet Export Code of Deputy. To find employee reference, edit the employee in MyPaye, and note their Payroll Ref. With these details matched, you are now ready to export the timesheets! 1. Select ALL or the employees you want to export. Your export should complete successfully! Total number of worked hours from Deputy will be transferred into the "Wages" qty column for each employee. Employee not found : make sure the pay ref and timesheet export codes are matching! No earnings rate : Deputy will only export wages. In order to do so, it will look for an earnings rate called "Wages" in the employee. If it does not find it, no hours will be exported.